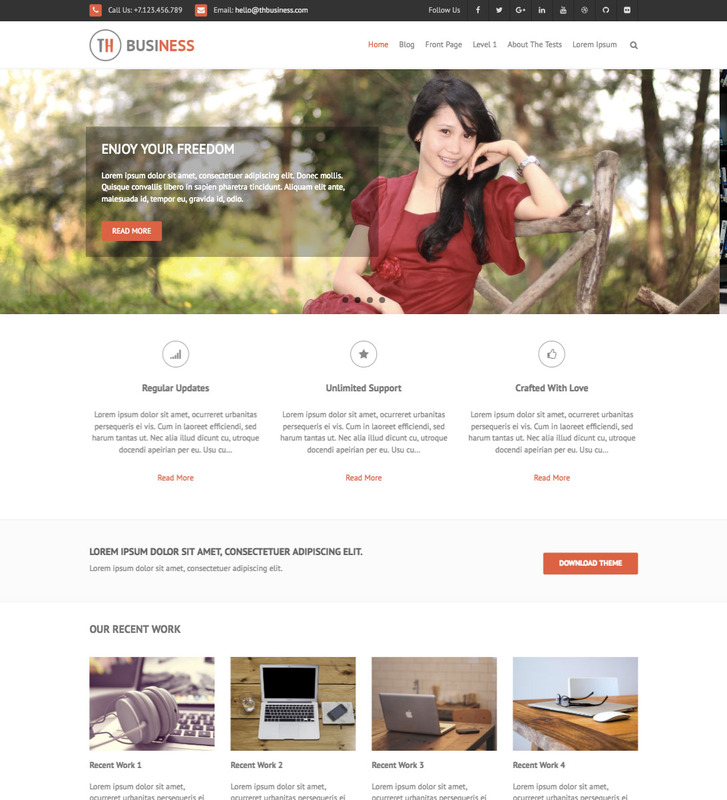 THBusiness WordPress theme is the first theme developed by themezhut for the official WordPress theme repository. THBusiness theme is mainly focused on the business home page layout while it has a elegant and simple blog layout. Fully featured widgets like Services, Recent Work, Call to Action, Testimonials,etc will help you to easily make the business layout. This theme is powered with twitter bootstrap so you can take advantage of it. THBusiness features a full width slider which is made with flexslider. Responsive layout of this theme gives a great user experience on any viewing environment like mobile devices, tabs and desktops. THBusiness does not have very complex options and the simplicity of this theme will help you to make your website very fast without touching a single line of code. We update the theme time to time giving more and more exciting features. THBusiness is built with bootstrap framework. You can view the theme on any viewing environment like mobile phones, tabs and desktops without any interruption. Following are the widgets bundled with this theme. Add them to their relevant sidebars to build your business template. You can change your theme color very easily using theme customizer. Use your favorite color to your website. One click to change all the colors. It is that simple. Go to Appearance -> Customize -> Colors and change the site main color. This theme features a full width slider which is built using flexslider. You can customize it using the theme options panal in the dashboard. THBusiness theme customizer will help you to easily add custom logo, favicon, slider and footer description etc. So you don’t have to edit the code to achieve those specific tasks. This theme has released under the general public license. It lets you to create and change your code without any restriction. You can download the theme and customize as you wish and make something new. -Added site main color feature. -Fixed the slider fading effect issue. -Added custom excerpt support for pages. -Added a top bar to the theme. -Added social media icons to the top bar. -Moved all settings of the Theme Options panel to the theme customizer. -Fixed a simple slider issue. -Added title tag support to the theme. -Changed widget titles h1 tags to h3. -Removed site title h1 tag for single posts and pages. -Added instagram icon to the topbar. -Fixed styling issues in customizer options. -Used jQuery(document).ready() method instead of jQuery(window).load() for homepage slider.